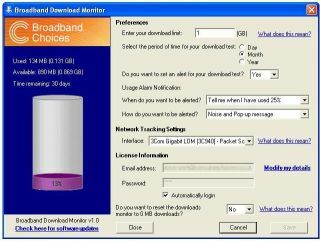 Broadbandchoices.co.uk has launched a free new tool that helps broadband users keep track of their download amounts. Aiming to help web users avoid penalties by staying within their broadband provider's download limits, the broadband download monitor will show how much data has been downloaded daily, weekly or yearly. According to the company, many people mistakenly think they are on unlimited contracts and can download as much as they want. However, 75 per cent of broadband packages have some kind of cap on them, according to Michael Phillips, sales director at Broadbandchoices.co.uk. "Even customers who have signed up to unlimited broadband packages can face fines under their provider's fair usage policy," said Phillips. Phillips also slammed ISPs for trying to cover the costs of offering ever-cheaper broadband deals by penalising customers that exceed limits. "Broadband providers are offering supposedly cheap deals with one hand, but clawing the money back with penalties for downloading," he said.